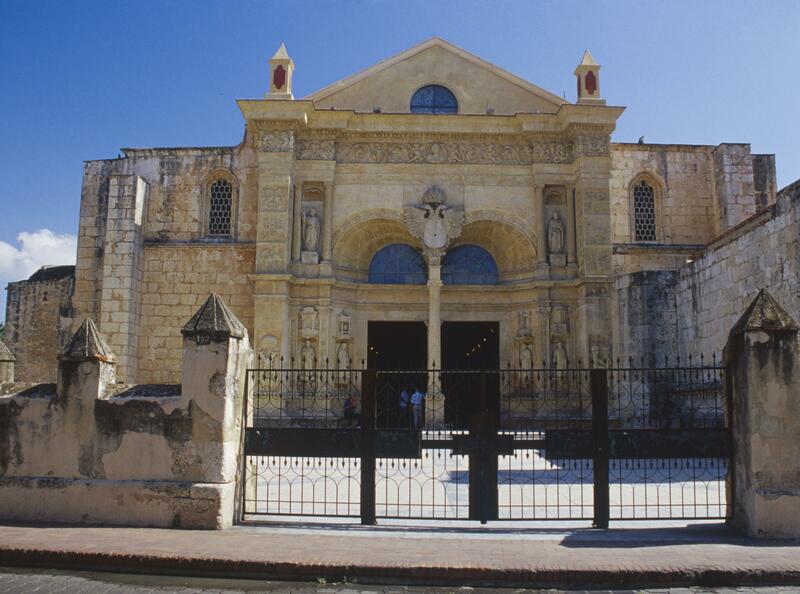 One of the first monumental buildings that Spanish conquistadors founded in the New World was the Santo Domingo cathedral Along with the Alcázar (also included in Vistas), the Cathedral is among the oldest extant European buildings in the Americas. The square format of the main façade, with its heavy pediment, is typical of Renaissance architecture. At the top of the portal, the decorative frieze of cherubs dancing among foliate motifs is not specifically religious and may have been inspired by decorative borders found in books imported from Europe, recast here in dramatically increased scale. Nestled between the arches of the double doorway, the double-headed eagle bears the shield of the Habsburgs, Kings of Spain at the time the building was created. Statues of saints adorn the niches in the second level, but these are replacements of the works that originally filled the spaces. Plateresque architecture, an early Renaissance form developed in Spain during the reign of Ferdinand and Isabella, is characterized by intricate, low-relief designs like those on this façade. The name comes from “silversmith” because of its similarity to decorations on luxury silverwares. Spanish architecture often drew inspiration from the Islamic architecture of southern Spain. Immigrant Muslim masons who were mentioned among the island’s inhabitants in the mid-16th century may have aided its transmission into Santo Domingo. Inside, at 50 feet (about 15 meters) the building’s vaults are high for the New World, but not Europe. For instance, the vaults of Seville’s cathedral, one of the largest in Spain, are 42 meters. 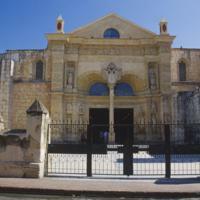 The Cathedral may have been designed by the Spanish architect Luis de Moya, who arrived in Santo Domingo in 1513. He clearly meant to introduce the vocabulary of the monumental Spanish buildings into the newly founded colony, particularly Gothic cathedrals and Plateresque design. As one of the first cathedrals built in the Americas, Santa María la Menor exemplifies how styles and religious practices known in Spain were transplanted across the Atlantic in the early 16th century. The elaborate structure speaks to the wealth and centrality of Santo Domingo in Spain’s early endeavors to settle in the Caribbean. This point is affirmed by the fact that Christopher Columbus’s remains were interred in the Cathedral from 1537-1795.